While I was organizing some tax stuff that I need to make copies to send to our son, a C.P.A., I played with a card to meet Red Rubber Inspirationals challenge for this week. I have to admit, I should never try to do 2 things at the same time. I do not expect to get even an honorable mention as there are a couple things wrong with this card. I will mention them at the end of the post and see if you pick up on them. I used a pack of paper called This & That from Echo Park. It's a great pack of paper with boy themed stickers and elements. 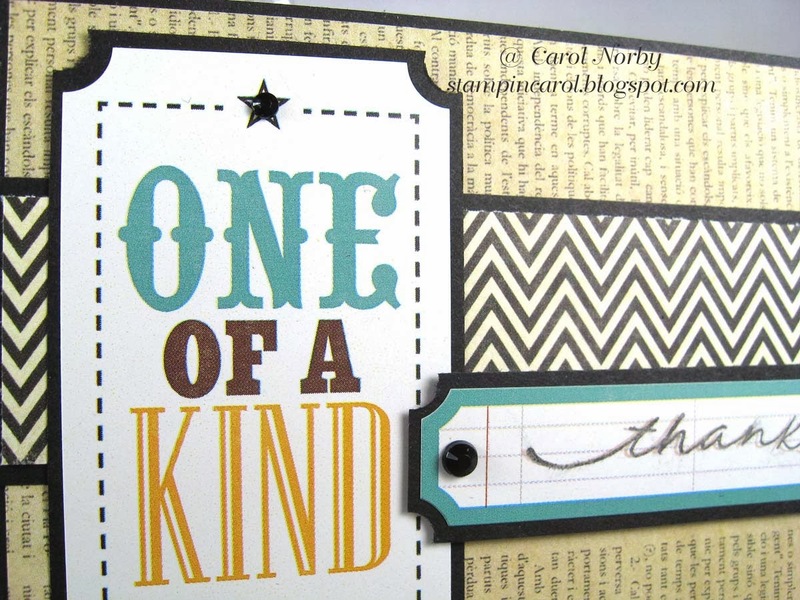 The "One of a Kind" and label are both stickers and I mounted them on black card stock and used my 1/4" hole punch to match the corners. The script thanks is from a Red Rubber Designs set called Mini Script. This set is on clearance for a GREAT deal right now. Did you figure out my 2 boo boos?? One is that I originally planned on the card being vertical so the background print is now going sideways. Oops! The other boo boo..... I stamped the text in brown by accident then overstamped with black then, horrors!!! It smudged! It's not a bad smudge but still a smudge. Rats. Oh well. Lesson learned.... don't multitask when making something for a challenge! I do realize that I am very critical of my own work. Does make creating a lot more difficult. Guess I better concentrate on getting my copies done before I do anything else at my craft table. Great card!! I love the design and pp's!! Thanks for joining us @ Red Rubber Inspirationals! Fun card design!! Thanks for joining us at Red Rubber Inspirationals! !